Ovi Maps with Free Navigation for Nokia E71! Nokia has announced today that Ovi Maps application offering free voice-guided car and pedestrian navigation is available for Nokia E71 and E66 devices! New Ovi Maps come with a lot of new core features plus new map data, voice guidance (to be downloaded easily with Nokia Map Loader or Ovi Suite 2 package installed on your PC). The easiest way to get new application is to go to nokia.mobi/maps from you mobile. Have you ever wanted to see text messages displayed on your glasses or maybe read incoming SMS using your brain power? Well, even if it not yet possible (at least not without being assimilated by the Borg :)) there is a very useful and free application, which simply displays next text message content on your display. No action is needed, no button needs to be pressed. You can choose for long the message body is going be to displayed and later of course read and reply the message as usual. I find it very useful during the meeting for example. The application called “SMS Preview” is available for free and requires sending only one message to register it. It can be downloaded directly with your mobile browser from m.smspreview.mobi, with your desktop browser from smspreview.net or from the Ovi Store: store.ovi.com. All Nokia phones users, including E71 owners, can update Nokia PC Suite client to the newest available version described as 7.1.30.8. Updated version’s release notes contain information about stability improvements and Nokia Music component replaces Nokia Music Manager. Check update menu in your current installation or download it directly from PC Suite web page. PS. Yesterday (Wednesday) next version marked as 7.1.30.9 has been released with comment about stability fixes. Check the newest available version as usual. One of the blog readers – Prashant mailed me just a moment ago that his E71 NAM variant suggested updating Nokia Internet Radio right after it was started. 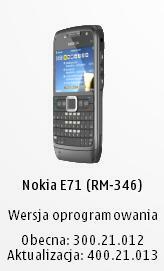 My E71 (European variant) asked a minute ago as well. New version described as 1.16(0). Unfortunately I haven’t found any release notes or change log for this version.